2000 pieds carrés 4 chambres, 2 salles de bains maison Au coeur des Berkshires. Notre maison ancestrale est située dans un cadre paisible sur une route calme à environ 1,5 km du centre-ville de Stockbridge. La maison est l’un des trois bâtiments de la propriété de 4 acres. Le musée Norman Rockwell, le sanctuaire national de la Divine Mercy, Tanglewood, le festival de théâtre Berkshire, Jacobs Pillow et de nombreuses autres attractions sont situés à quelques minutes de route. Marcher en ville, sur la route ou le long des voies ferrées, tout en admirant le paysage et en explorant le long du chemin, est un excellent moyen de passer la matinée ou l’après-midi. Chambre 4 - accès par la chambre 3. un lit complet. Les climatiseurs de fenêtre sont dans chaque chambre. Un climatiseur au rez-de-chaussée refroidit tout l’étage. Un deuxième climatiseur est disponible si nécessaire. Une entreprise familiale d'aménagement paysager, obscurcie par les arbres et les arbustes, existe à env. 100 mètres de descente derrière la maison. Quelques camions peuvent sortir de la propriété à 30 mètres à droite de la maison à 7h et revenir à 15h du lundi au vendredi du printemps à l'automne. Nous n’avons reçu aucune plainte d’anciens clients ayant loué la propriété tous les soirs, toutes les semaines ou tous les mois pendant ces périodes. S'il vous plaît n'hésitez pas à vous renseigner avec des questions. Perfect! Nice, comfy and VERY well kept! What a beautiful, well kept and nice rental! This is an older home, with lots of character, but has been well maintained and upgraded to have all the modern conveniences, including nice new bathrooms, new kitchen with all modern appliances, and of course WiFi, essential these days. This has got to be one of the cleanest homes I have ever entered. Not a blemish or speck of dust anywhere. You hardly have to bring anything, the kitchen is fully equipped and there are plenty of nice towels, sheets, blankets, with all beds nicely made on arrival. The location is really hard to beat, quiet but just minutes drive to Stockbridge center, and from 5 to 15 minutes to Lenox, Stockbridge or Lee centers. Also, plenty of room for a family, everyone can have their own space when they want it. We thoroughly enjoyed our 12 day stay at this wonderful family home near Stockbridge Center. The home was fully equipped with all necessary linens, towels, kitchenware and appliances, etc The motif is dated, but adds to the character of the home. The home comes with a family caretaker who lives in another structure on the grounds who is available to help in any way possible and who was very very attentive and friendly. Gratefull that we chose this home! The home was clean, updated, and very comfortable. We will stay again and again in a home like this! Our family of 5, with 3 adult children, immensely enjoyed our Columbus Day weekend stay at the Stockbridge Farmhouse. The house feels very spacious - perks of eat in kitchen, separate dining room, ample sized bedrooms, lovely sitting and living room areas. It feels well loved and lived in, clean and well equipped. The cabinets in the kitchen go on and on - a space for everything, and every utensil, pot, pan you could want. Two sets of dishes, one for everyday and one in the china cabinet, for dinner parties. We had friends and family join us for dinner one night - there were eight of us at the table, and we didn't even use all the extra table leaves. But what I like most about the house is the feeling of peace that pervades it. The first floor living/dining/kitchen areas are at interesting angles to each other, so sitting in one, you can see through to another, each with its own windows looking in different directions. The house is surrounded by trees (there is a yard to sit in, don't worry). And the dappled sunlight in the morning is more than lovely. 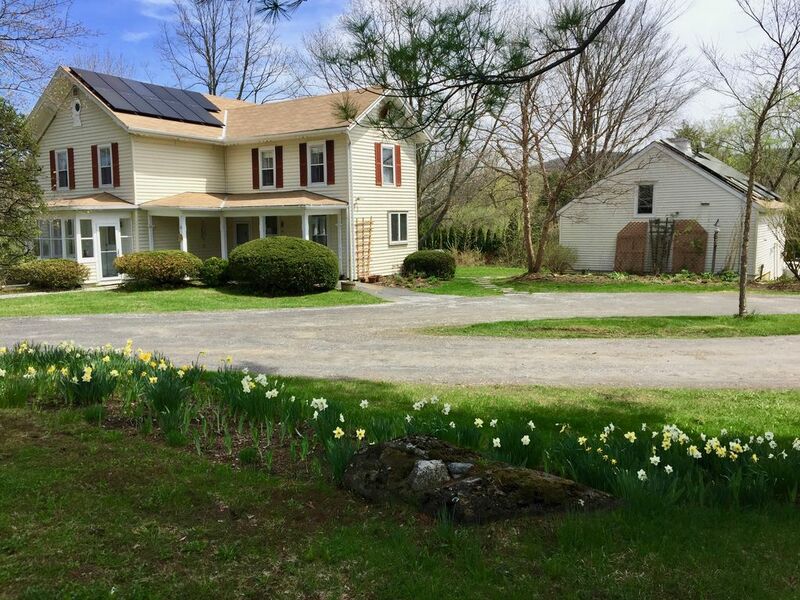 The house is in a great location: minutes away from Stockbridge town center (which is in the heart of the Berkshires) but with a feeling of being on its own, out in the country. Siblings Katie and Bill, whose great grandfather built this house, were super, very pleasant, efficient and helpful; Katie takes care of the arrangements, and Bill is the caretaker who lives in another house on the property. In short, I most highly recommend the Stockbridge Farmhouse for your stay in the Berkshires. This house is immaculate, well stocked and comfortable. Everything you could ask for is provided. The kitchen and bathrooms sparkle. The towels and linens are beautiful and look new. The landscape and flower gardens are beautiful and while you have a sense of being in the country you are actually within a few minutes of main St. We love this house and would highly recommend it. We love Bill who lives in another house on the property. He is super helpful and even let me use his Big Y card. Delightful in every way. A warm welcoming home that is well maintained and lovely. It is a 5 minute drive from downtown but you are in the country. We saw some juvenile Bobcats in the brush! Loved the time we spent there. Highly recommend this home. Rates as listed are for up to 4 persons. There is a $50 a night charge for each person up to seven. Rates are subject to change until reservation is confirmed A cleaning fee of $150.00 with a two or more night stay and $250.00 with a one month or more stay. 2 night minimum from Sept until the end of June 3 night minimum for all holidays Pets are an additional charge of $50 per pet per stay plus an extra $250 refundable security deposit.